Many Christians find the Old Testament to be a difficult book and ultimately ignore large parts of it often because they simply are not sure what to do with it. Yet Iain Duguid maintains that the Old Testament is for Christians too. What is more, Christ is present throughout the Old Testament in fact, when rightly interpreted, the whole book is about him. Duguid explores what it means to rightly see Christ in the Old Testament and looks at some specific ways the Old Testament prepares us to see and understand Christ's ministry in the gospels. 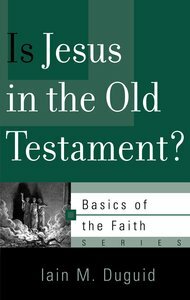 About "Is Jesus in the Old Testament? (Basics Of The Faith Series (Formerly 'Reformed' Borf))"